As a Hollywood screenwriter burdened with a hair trigger temper and seemingly psychopathic predilection to violence, Humphrey Bogart delivers one of his great late-career performances. 'In a Lonely Place' marries the mysterious tension of the unknown in Hitchcock’s 'Suspicion' and 'Shadow of Doubt' with director Nicholas Ray’s interest in brooding and damaged enigmatic characters. 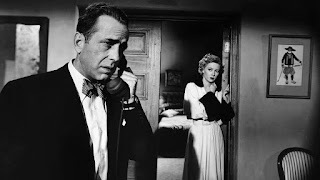 The central idea of this picture is a straight out of Hitchcock’s playbook, an attraction of the story’s hero, Dixon Steele (Bogart) to his lovely single (and blonde) neighbour is threatened by a looming investigation to a murder of another lookalike ingénue who may or may not have been murdered by Steele. The opening scenes establish Bogart as a suave yet strangely anti-social screenwriter seemingly courting a coat check girl at dinner who has read the novel on which Dixon’s next screenplay will be based. He takes her back to his apartment complex as research. Is Dixon putting the moves on her, is he taking advantage of his position of power? Ray cleverly keeps us in the dark for much of these scenes, carrying this simmering tension throughout the whole picture. When the girl turns up dead the next day Dixon becomes a suspect. Enter Dixon’s old pal Brub Nicolai (Lovejoy) who is a police detective in the case. Strangely, despite Nicolai’s involvement in the case, their social friendship continues, perhaps in an effort to sniff out more evidence. Meanwhile Dixon courts a neighbour, Laurel Gray (Grahame) in his complex who is serving as his alibi that evening. Again, a strange relationship in light of the gruesome association the two have together, develops. Amidst these allegations is a lurid romantic melodrama of Dixon and Laurel, who seem linked mutually by their own solitude and murky pasts of relationship failure. Gloria Grahame gradually takes over the picture when we begin to see the relationship through her eyes. As more information about Dixon’s violent past gets revealed the more she suspects him as the murderer. And yet, she still stands by him. Ray crafts a number of tense sequences along the way which reveal the danger Dixon poses to Gray. Bogart (also a producer of the film) moves effortlessly between the Hollywood cool of his Sam Spade or Rick Blaine roles to that of a menacing psychopath and later to an empathetic loner trying to find love and escape his demons. As an early film in Nicholas Ray’s prolific career in the 50’s and 60’s, like They Live By Night and On Dangerous Ground, In a Lonely Place is fashioned as a classic post-war noir. And yet, as much as the mystery surrounding Dixon’s involvement in the murder creates most of the suspense, it’s Bogart’s internal demons and issues with anger management which carries film. Ray and his writer Edmund North and Andrew Solt are crystal clear with their point of view and disregard any temptation to deal with the investigative/procedural details of the case. Ray takes the road less traveled and examines the pathology of violence from the internal perspective of Dixon himself. In the end the mystery of who murdered the coat check girl is answered without fanfare. Ray saves his climax for Dixon and Grahame melodramatic reconciliation as psychologically tortured lovers. In a Lonely Place is available on Blu-Ray through the Criterion Collection.